Twenty five years ago, in May 1993, give or take a few days, I stood here in Havířov, the city that we would move to six months later in order to begin the ministry of Josiah Venture. babičky (grandmas) were saying about us???? 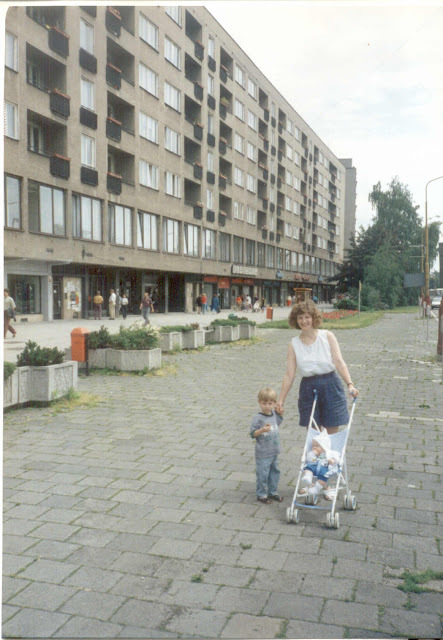 I didn't know about awesome Czech kočárky (prams) back then! Tyler was almost 2 1/2, and Caleb was four months old, little guys who had no idea what was about to happen in their lives. And Claire was just a twinkle in our eyes! I look at this picture and think, "You have no idea what's coming either"! To say the least. Who, except the Lord, could know all that would transpire in the days, months and years after that moment in time where we stood on the main street of the city we'd move to, praying that someday a movement of God would spring from our little decision to obey him. 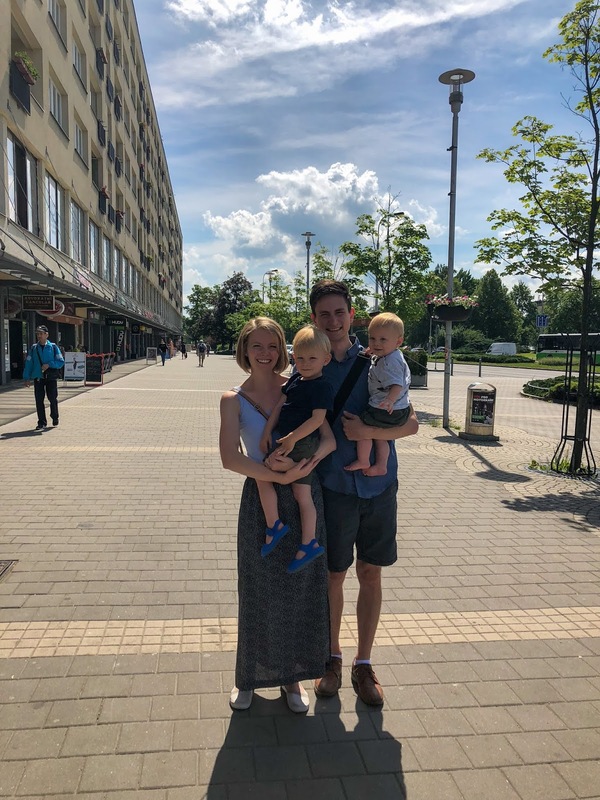 Today, I met up in Havířov with Tyler, Lara and the boys for a completely different reason than marking this occasion. But when I realized the significance, I asked if I could take a picture of them -- they are part of the fulfillment of those prayers, God's movement in this country and beyond. Hopefully you recognize that they're near the same spot where Dave took the picture of the boys and me years ago. Parking spots are now in the place where we took that picture, so Tyler, Lara and boys are farther over on the sidewalk for their picture. But it's close to the same place! 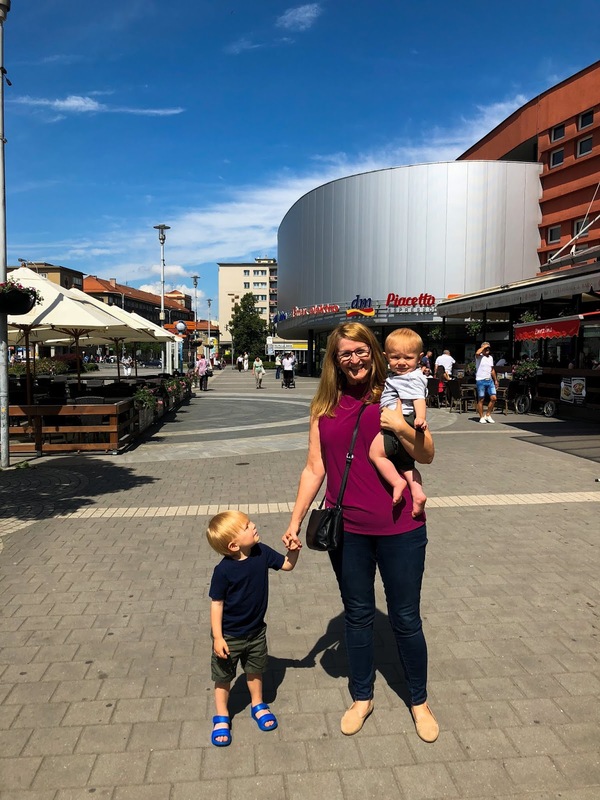 And I got to take a picture afterward with two other little boys who have recently moved to Czech...Judah and Asher. I sure never saw ahead to this scenario, but OH HOW GLAD I AM FOR IT!!! You never know what will happen when you pray a big prayer asking God to move.